We thank you for your continued business and look forward to serving you in the future. The missing comma is part of the original letter, and it is not the only thing left out. This is the traditional letter saying we’re doing this at this time, this will happen, we want your money so we give options, and a false form of gratitude. They left out the why they see the necessity to take more money from my earnings and my lifestyle. Throughout the economy, which 90% of the American public thinks is terrible and hopeless courtesy the media, people wages drop, and prices keep increasing. Another trend, an obvious one, is that the average “consumer” (which is all we do right?) is more educated and aware of business realities. The old “consumer” model from economics class is changing in this way. I want to know why they are increasing their fees, if the company is brave enough to tell me their justifications. Adding a line explaining that material fees for this have increased and the unions of NY have negotiated better salaries is enough to justify the increase. To avoid controversy, such justifications are left out because the increase could be attributed to the demands of increased CEO salaries, which requires the $5 per customer and a factor of 200,000 customers. This is a real reason why a smart customer might be angry. 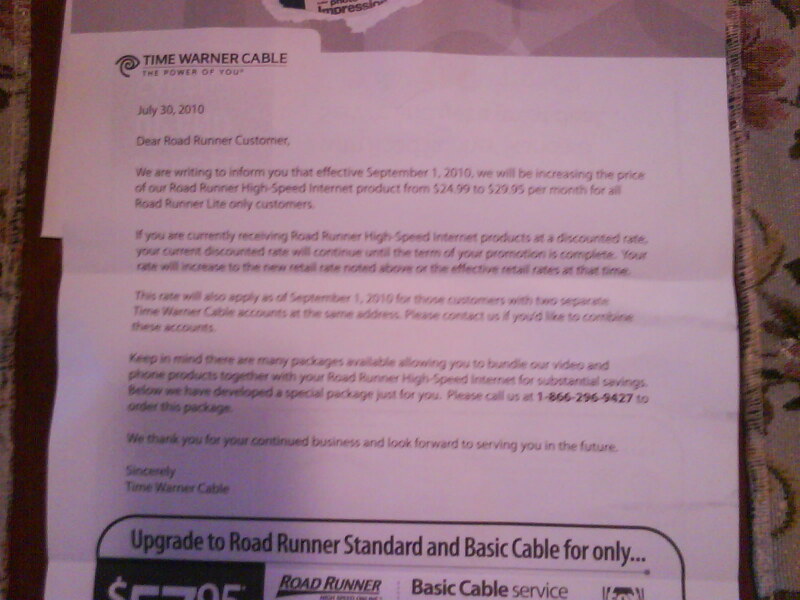 As 2010 moves forward, I think I, the average consumer, am going to dig into the practices of Time Warner, and see where that $5 is going and investigate other ISP service providers.